Physical Therapy Reviewer – The truth defies simplicity….. This view might not be too popular among some but it is something that I think is worth mentioning. I wish more people in our profession dedicated their efforts to creating content that targets the public or is public facing. As someone who oversees some of the largest groups for physical therapists (PTs) (here, here and here) it never ceases to disappointment me by how often PTs create new accounts which basically just repackage previously created content or ideas and then share them to other PTs. While it is important that we discuss and share information among ourselves as PTs, how many accounts do we need that share the same information and content with dissemination strategies that are really limited just to PT groups? Come on man, at least be original or at least share content beyond the confines of the same PT groups! The real battle is educating and motivating the public (and other professions) to address the many problems facing our healthcare system upstream. It is not creating another for-profit or self-serving PT mentoring group etc. This is not to lambaste people for creating such groups, accounts or content. Instead it is a call to action to use your creative efforts to take on a larger and more pressing challenge. It also might be to your benefit, the most successful pages and personalities in our profession are those that are more public facing (KStarr, Prehab Guys and Rehab Science just to name a few). From a business and marketing standpoint (in most instances) it is better if your content reaches or is more relatable to a broader audience. Think about it, there are only about ~250K PTs in the USA, while there are 325 million people in the USA (and 3.9 billion internet users worldwide). There is a rather smaller carrying capacity for marketing or sharing content just to other PTs. You would be surprised by how many people are looking for information related to their health and health related problems online and through social media; and how often. And then we wonder why the collective mindset of the public retains outdated, outmoded or incorrect views/beliefs about the human body, health and disease; think of some of the things patients say about their back pain, or “toxins” etc. Those aren’t ideas or beliefs that they came up with on their own, it is likely something they read online or social media (or heard from a clinician). Because the people that most often realize the benefit of being public facing are the nonsense peddlers who prey on the staggering healthcare and scientific illiteracy rates in this country (and around the world). They have been successful because they have gone UNOPPOSED for years. In summary, not only is this more public facing or direct to consumer approach beneficial for improving the status of our profession and potentially your own finances, it will help our patients by offering a discerning voice to the overwhelming amount of nonsense that exists. A light in a world of darkness. A compass in a chaotic healthcare system! I could not think of a better title for this article that did not involve profanity. That being said, I want to take a few paragraphs of your time and discuss an often stated, unfounded explanation given to patients as a cause of their pain. The narrative of a rotated hip joint (ilium on sacrum) causing some type of dysfunction is completely unfounded in the literature. I am going to argue this from three points that will hopefully give the reader an understanding of why this narrative is wrong, and potentially harmful to patients. To all of my friends and family read below. HB 4643 has passed out of committee and will go to the House! This is the closest IL has every been to Direct Access for Physical Therapy Services. Please call the IL reps, even if you aren’t in Illinois. The more states that have direct access, the larger chance the states that do not will move toward it. The Illinois Chiropractic Society has stated they are against PTs having direct access, mainly since this would put us on a fair playing field. We can pretty much guarantee every Chiro in Illinois will be on the phone to their reps, so lets do the same. All the info you should need is below. We received great news today as our DIRECT ACCESS BILL PASSED OUT OF COMMITTEE. Now our DIRECT ACCESS bill heads to the House floor and we need your help NOW! Below is a template letter that we would like you to forward to your House Representative in support of House Bill 4643. The full House will be voting on House Bill 4643 on Thursday or Friday. I am writing to ask you to vote YES on HB 4643 as amended, which would provide direct access to physical therapists for Illinois residents. This is a practice which is already occurring in 44 states, several of which are not restricted in any way. The amendments, in summary, provide that a physical therapist may provide services to a patient without a referral from a health care professional for 10 visits or 15 business days whichever occurs first. The bill also ensures that the physical therapist notifies the patient’s treating health care professional within 5 days, ensuring that all health care professionals in the continuum of care are informed of the patient’s treatment plan. In addition, we have reached an agreement with the dentists and the chiropractors that addressed concerns relating to the treatment of temporomandibular joint disorders and length of care. This important legislation will provide better and faster access to physical therapy for all populations, including Medicare patients, and will help in the fight against opioid abuse in Illinois, as physical therapy is a non-prescription, non- addictive way to reduce pain. We appreciate all stakeholders work on this bill as well as the work of legislative staff to bring HB 4643 without any objections from any stakeholders. It is important that every legislator hear our message from many constituents. The legislation gives the public Direct Access to physical therapists in Illinois. You can access HB 4643, House Amendment 001, 002, 003 at www.ilga.gov. Click on “full text” to read amendment. A new definition labeled 1.2. Physical Therapy Services, allows direct access. There are a few protections for the public and they are reasonable. 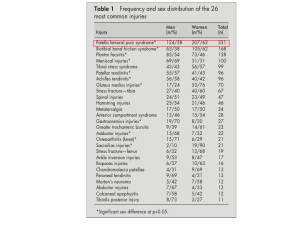 According to a retrospective case-control analysis by Taunton et al, of the 2,002 running-related injuries seen at a primary care sports injury facility, 42.1% (842/2,002) were knee injuries. Of these knee injuries, 39.3% (331/842) were due to patellofemoral pain syndrome (PFPS), which made PFPS far and away the most common disgnosis found in this large-scale study. Additionally, an older study done in 1984 showed similar results. Devereaux et al found that over a five year period, 137 patients presented with PFPS, which accounted for 25% of all knee injuries seen at this sports injury clinic. These two studies were conducted 17 years apart, giving support to the consistently high prevalence of this disorder, but the real question is, how are we treating these patients?